white form of Campion that attracts moth for its nectar. 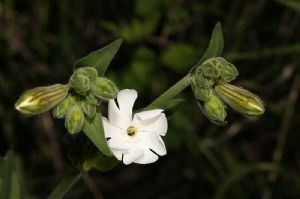 White campion grows in most open habitats, particularly wasteland and fields, most commonly on neutral to alkaline soils. Despite the wide array of conditions campion can thrive in, it prefers sunny areas that have rich and well-drained soil. It is also named the Grave Flower or Flower of the Dead in parts of England as they are seen often growing on gravesites and around tombstones. plug plants available currently, sold in 3s..